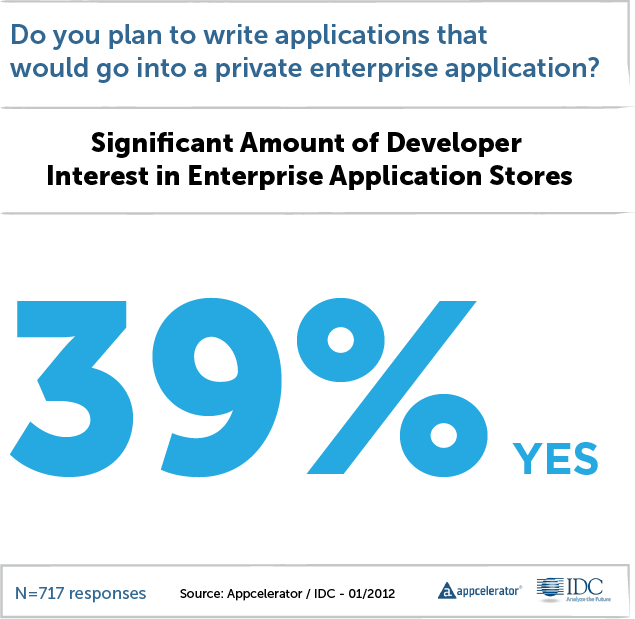 Appcelerator®, the leading mobile platform company, and industry leading analyst firm International Data Corporation (IDC), today announced results from a new joint survey of 2,173 Appcelerator developers around the world. Findings reveal developers’ accelerating interest in social mobile capabilities, and – notwithstanding Facebook’s 900 million users – developers view Google and its broad range of assets (i.e., Google+, search, Gmail, Android, Android Market, etc.) as key to implementing their social strategies in 2012. The report also shows that Android – once neck-and-neck with iOS – is seeing waning interest due to continued fragmentation of the platform, and that HTML5 will play a bigger role in the mobile app development space this year. 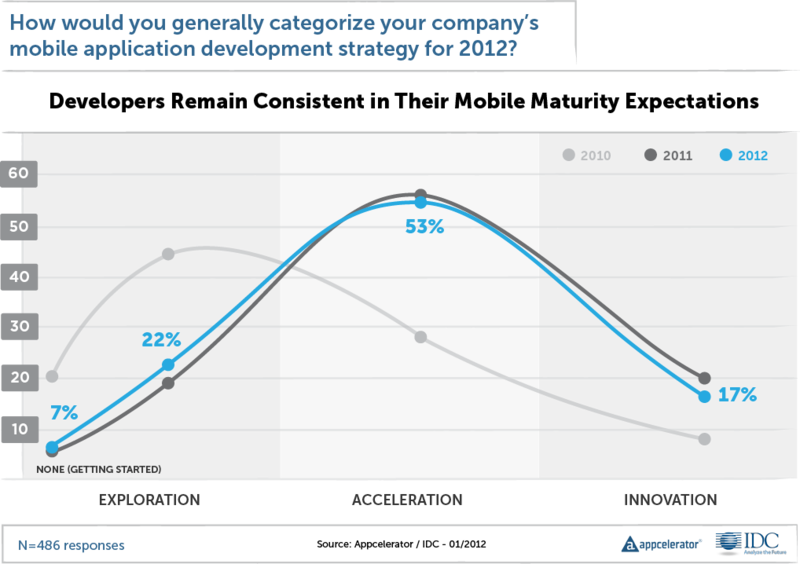 Appcelerator and IDC also continued to observe a maturation of mobile strategies, as companies move from Exploration towards Acceleration and Innovation in their mobile initiatives. The full report is available free for download at http://bit.ly/q1-2012-report. Developers clearly see the worlds of mobile and social coming together as a huge opportunity, but they are struggling to understand how to leverage social assets in their mobile apps, including Facebook's social graph. At the same time, they recognize immediate value in having easy integration capabilities represented in Google’s combined network effects with Google search, YouTube, Gmail, Google Maps, etc. 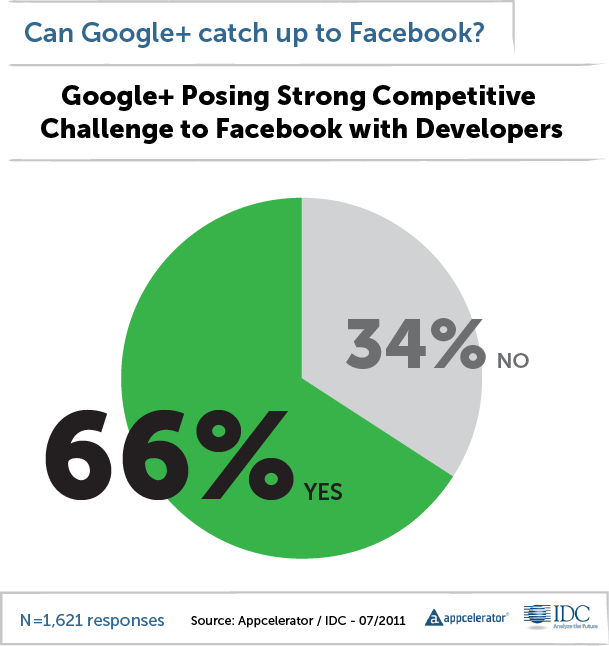 In fact, 39% of developers say that the network effects of Google’s broad range of assets are more important to their social strategies in 2012 than Facebook's social graph. For all of the excitement and opportunities that social networking creates within the mobile ecosystem, this survey revealed developers don't feel they have the knowledge or tools to fully leverage social in their app strategies. There are opportunities for established players like Facebook, LinkedIn, and RenRen, as well as for challengers like Google and even Apple, to engage, educate and provide tools to help contribute to developers' success, and drive engagement with their platforms. The mobile app space to date has been dominated by native apps. However in 2012, HTML5 will move to center stage with both pure mobile browser apps and “hybrid apps,” which integrate both native code and substantial amounts of HTML5. This approach will help developers innovate across a crowded mobile landscape that has seen iOS, Android, and Windows 7 claim the top 3 spots, while RIM and others have experienced significant declines. While Android has seen enormous growth in shipments and remains a solid #2, fragmentation continues to take its toll. 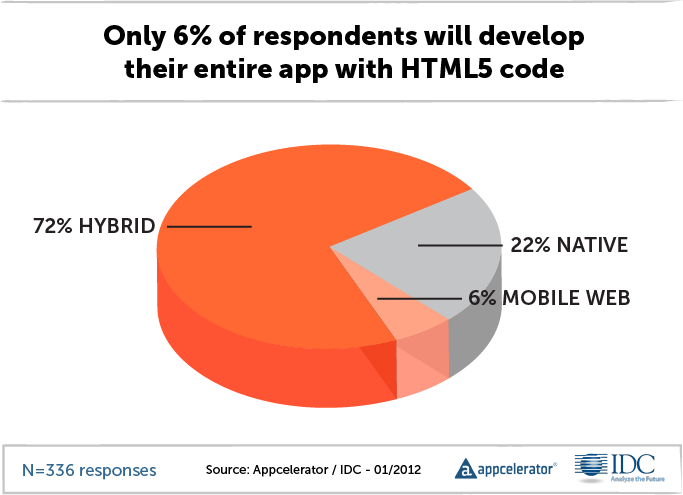 HTML5 becomes important to many mobile developer strategies. 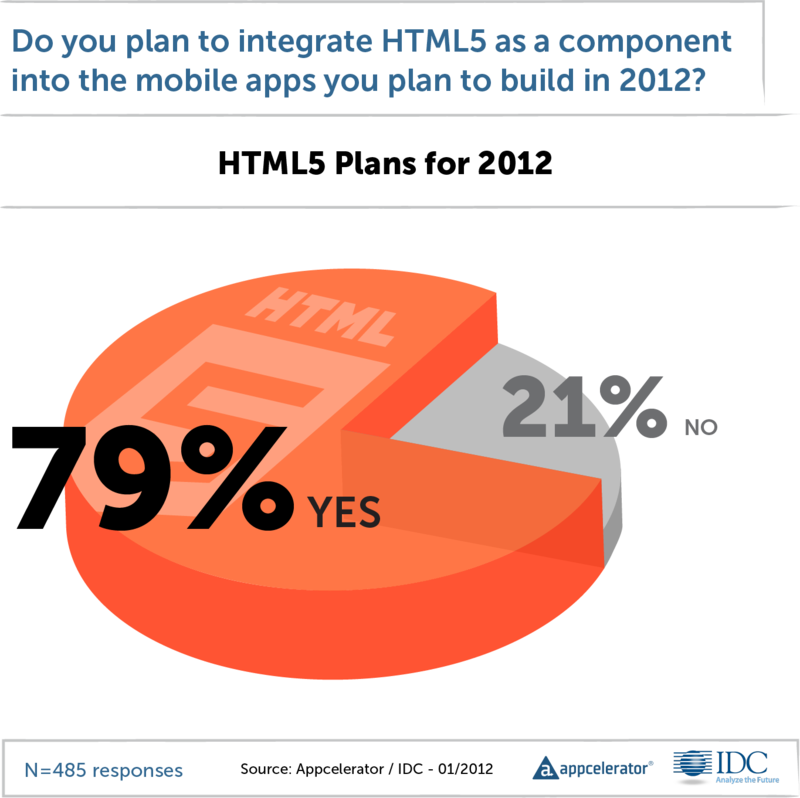 A resounding 79% of mobile developers report that they will integrate HTML5 in their apps in 2012. This is much higher than many industry observers had anticipated as late as Q4 2011. Developers are struggling to understand and leverage Facebook's social graph. 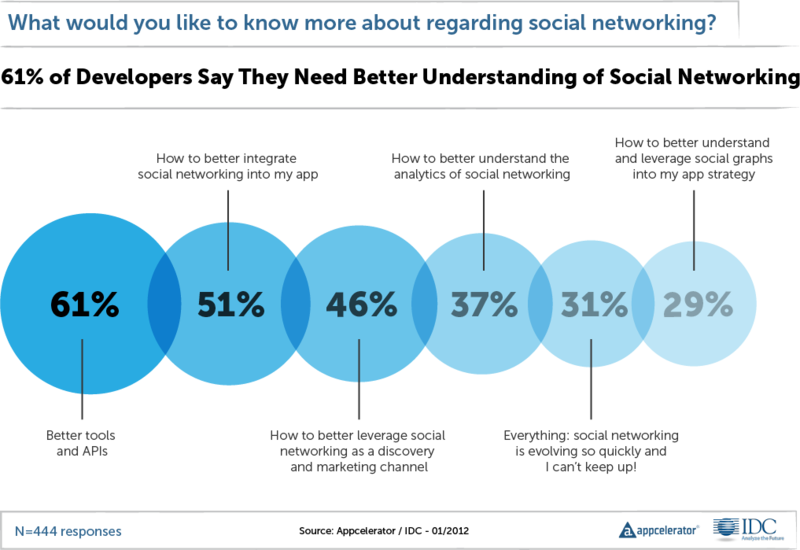 Leveraging the full social graph itself ranked low - tied for 8th out of 11 social priorities for developers, while developers’ top uses of social remain notifications, status updates and authentication. Google's network effects of its vast assets are a key strategic differentiator against Facebook. Google's footprint across its assets (search, advertising, YouTube, Gmail, Android, Maps, etc.) 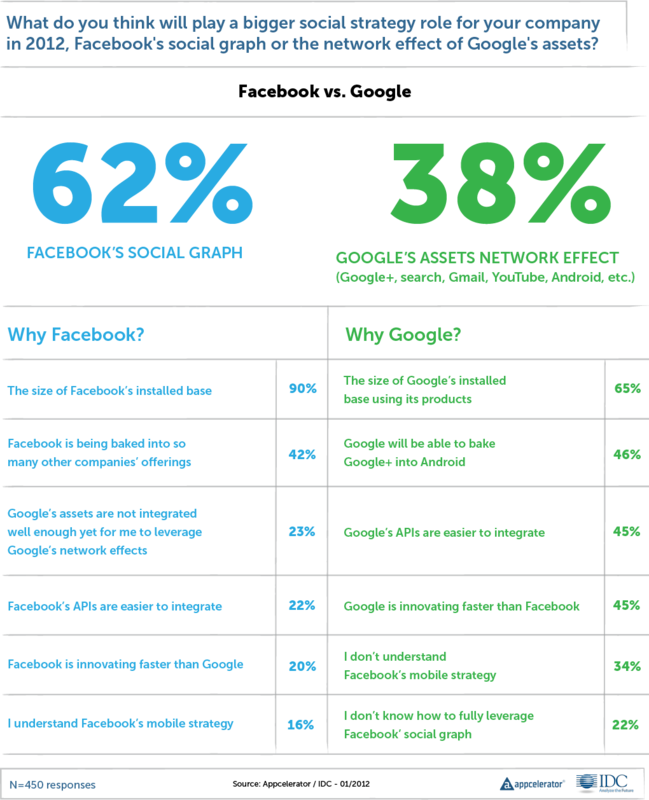 and its resultant network effect is indexing higher than expected, given the size of Facebook's massive lead in social. 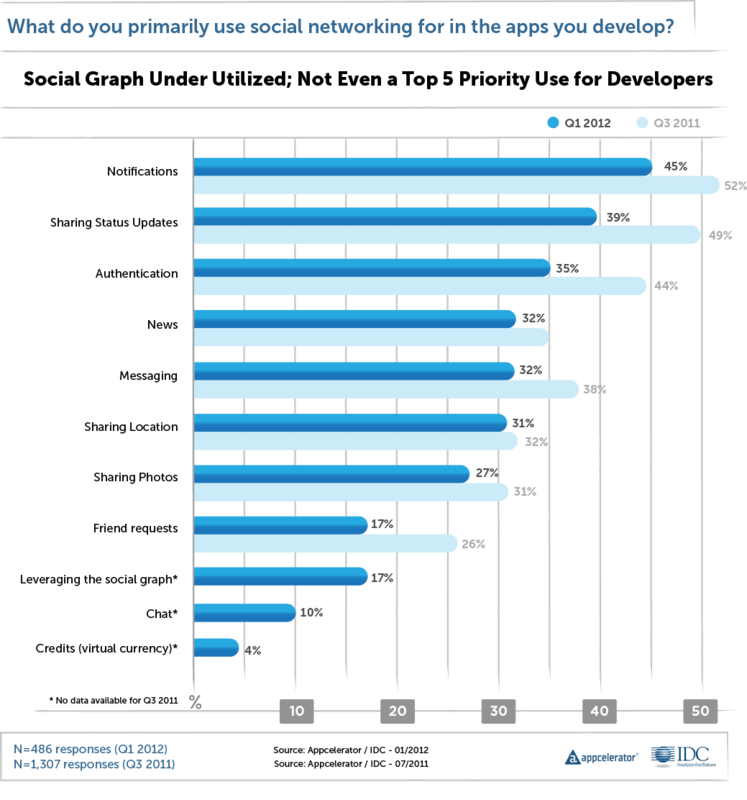 Mobile app development continues to Accelerate in 2012. More than half (53.5%) of respondents report that they are now focused on Accelerating their mobile strategies compared to 27.4% in 2010, and 16.9% of respondents report that they will be focused on Innovating their mobile apps in 2012 compared to 9.2% in 2010. Windows Phone 7 interest remains high. WP7 is the clear "number three" OS in terms of priorities, after Apple's iOS and Google's Android. 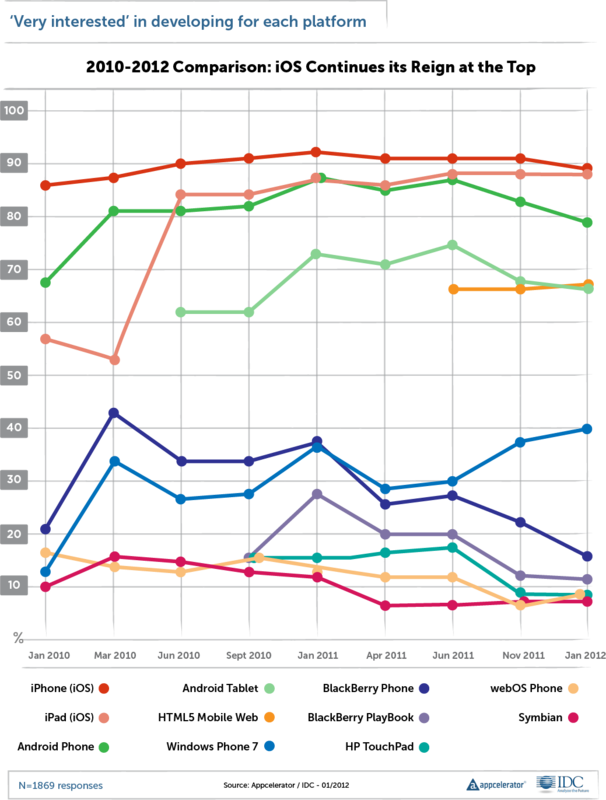 The huge jump in interest in Q4 2011 is holding steady notwithstanding somewhat disappointing WP7 device sales to date. This quarter saw another sharp drop in developer interest in BlackBerry OS. Developer interest declined from 20.7% in Q4 2011 to 15.5% in Q1 2012, set against negative news around RIM's challenges. iOS continues to reign at number one in developer interest levels. Eighty-nine percent (89%) of respondents say they are very interested in developing for the iPhone, followed by the iPad at 88%. Android phones and tablets are showing slow erosion of interest levels. This quarter, interest in Android phones dropped 4.7% points to 78.6%, and Android tablets dropped 2.2% points to 65.9% from the previous survey. Although close to or within the margins of error, these drops are consistent with the trend of small but steady erosion in Android interest over the last four quarters, even as enormous growth in Android unit shipments continues. 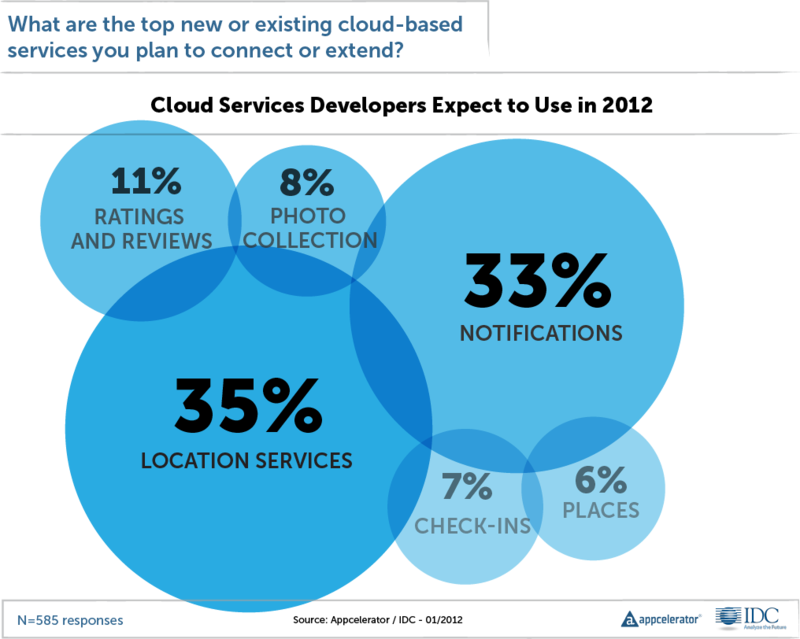 Location and notifications are the top two cloud services developers plan to use to help scale. 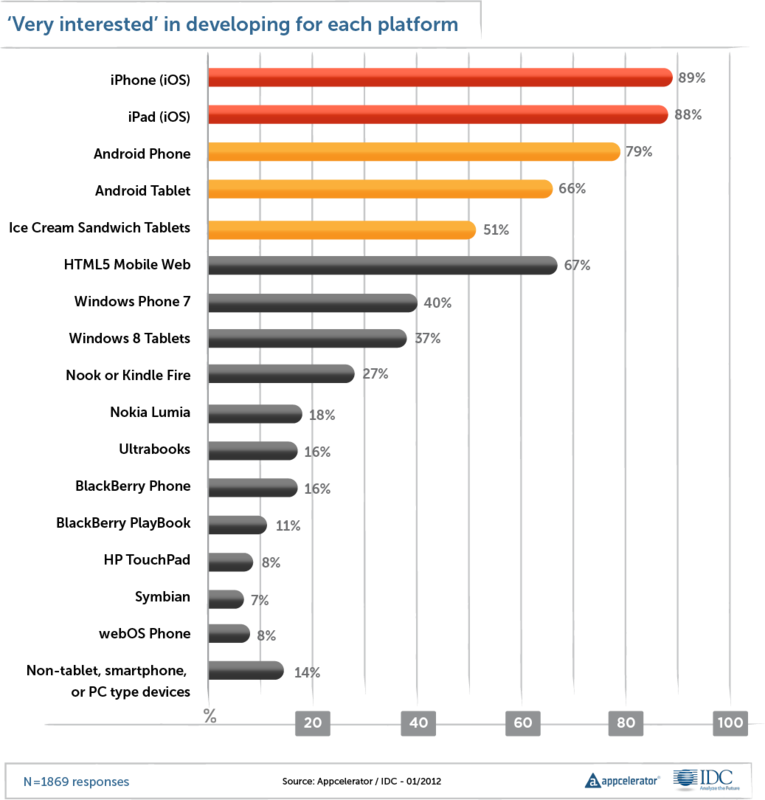 Location and notifications are the top two services that developers plan to integrate into their applications to help scale up their mobile initiatives in 2012. Developers continue to move toward a maturation of their mobile strategies: to Acceleration and Innovation and away from initial app market Exploration. A majority of respondents believe they are clearly in the Acceleration phase now, with the expectation that they will be building multiple applications on a number of different operating systems. Throughout the survey, messages of a gradually maturing market permeate. Growth in the number of developers building mobile applications, growth in the number of operation systems and applications supported, growth in the size of companies that are building mobile applications as well as increasing numbers of hybrid teams (both internal application development teams combined with external application development teams) are all evidence of this maturity. This quarter's survey underscores that 2012 will mark key shifts in platform strategies, how social will be leveraged, and how fast these changes will emerge in the marketplace. A complete breakdown of these trends and a more detailed analysis is available online: http://bit.ly/q1-2012-report. Appcelerator’s Titanium is the leading mobile platform of choice for thousands of companies who are seizing the mobile opportunity. With more than 35,000 applications deployed on 40 million devices, Appcelerator's award-winning Titanium Platform leverages over 5,000 mobile device and operating system APIs to create native iOS and Android apps, as well as HTML5 mobile web apps. Customers who standardize on the Titanium Platform get to market 70% faster and can quickly optimize business results with analytics–driven insights into user behavior and app performance. The open and fully extensible Titanium Platform makes it easy to integrate data, content and services from a variety of sources into mobile applications to leverage best–of–breed capabilities. Appcelerator Cloud Services (ACS) provides instant social, location, communication and content features for user-centric mobility. ACS is pre-integrated into the Titanium Platform and is also separately available for all mobile developers and publishers. Appcelerator’s worldwide ecosystem includes 1.6M developers and hundreds of ISVs and integration partners. Please visit http://www.appcelerator.com or http://bit.ly/GBuVLl. International Data Corporation (IDC) is the premier global provider of market intelligence, advisory services, and events for the information technology, telecommunications, and consumer technology markets. IDC helps IT professionals, business executives, and the investment community to make fact-based decisions on technology purchases and business strategy. More than 1,000 IDC analysts provide global, regional, and local expertise on technology and industry opportunities and trends in over 110 countries. For more than 46 years, IDC has provided strategic insights to help our clients achieve their key business objectives. IDC is a subsidiary of IDG, the world's leading technology media, research, and events company. You can learn more about IDC by visiting http://www.idc.com.